Bob Metcalfe, Dave Boggs and the rest of the scientists at Xerox Palo Alto Research Center in 1973 were a lot like young developers at a Silicon Valley startup today. "Beards, Birkenstocks, blue jeans, T-shirts," Metcalfe said earlier this month, recalling how he and his colleagues looked and dressed when they went to work at the cluster of modern, low-slung buildings amid suburban fields during its heyday 40 years ago. He was 27 then. "I had a big, red beard," the gray-haired Metcalfe said. When he and his colleagues padded over to PARC's main conference room in their German hippie sandals for a meeting, they flopped down into beanbag chairs, the only seating in the room. And as in a startup, the relaxed setting disguised an intense environment. "We worked around the clock, generally." The proto-Silicon Valley geeks even had the Internet, once Metcalfe had set up the connection soon after arriving at PARC in June 1972. At that time it was in an early form called Arpanet, over which researchers at PARC and other institutions could log on to other computers over long distances. But Facebook, Netflix cat videos and even the Web were still many years away. The staples of the modern Internet would require a much faster network. It would start with one fast enough to send memos to the laser printers PARC was inventing. The rest would come later: email, images, voice, music and video, all in little bundles of moving data called packets. Metcalfe and Boggs, then a graduate student at Stanford University, worked for months to build such a network, drawing on Arpanet's packet concept and help from many others at PARC. In a memo to the team on May 22, 1973, Metcalfe described the architecture they'd conceived and gave it a name: The Ether Network. The name would stick, and the technology would advance, until today another generation of researchers is starting to explore an Ethernet that will carry 1 terabit per second. 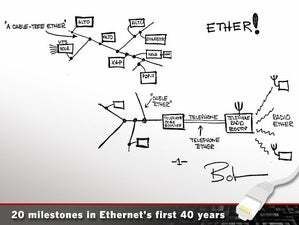 On Wednesday, Metcalfe and others who were present at the dawn of Ethernet will mark its 40th anniversary at an Ethernet Innovation Summit at the Computer History Museum in Mountain View, California. Ethernet wasn't an accidental discovery. After spending about two years working on Arpanet, Metcalfe was hired at PARC to develop a network that would link the new computers there. A PARC visionary named Alan Kay had invented a system called the Alto, which was a whole computer for each user's desktop. "A problem was created that had never existed before," Metcalfe said. "And that problem was, 'What do you do when you have a building full of personal computers?'" There were some LANs in those days, but they had serious limitations, Metcalfe said. PARC used one, called the Data General MCA, between its Data General Nova minicomputers. But it could only connect 16 systems, and they all had to be in the same room. The cables were about 1.5 inches thick, he recalled. At their desks, Metcalfe and his colleagues had ASCII text terminals that talked to a minicomputer at 300 bits per second. That wasn't enough speed to send files to a high-resolution, one-page-per-second laser printer. They were entering tomorrow's digital world with yesterday's connectivity. Though not everyone at PARC agreed, Metcalfe said, he insisted that networking was critical for the new computers. "All that power would be for naught if they weren't connected," Metcalfe said. The system Metcalfe and Boggs envisioned would leapfrog any LAN of the time. "Our spec was, we wanted to connect 255 personal computers at a distance of a mile, at some number of hundreds of kilobits per second ... and we wanted to do it with a minimum of cabling, because the predecessor networks all had these rooms full of cables that we called 'rat's nests,'" Metcalfe said. The network that Metcalfe and Boggs proposed met all those qualifications, including a top speed of 2.94Mbps. If you got that speed today, you might say you were getting 3Mbps, which would be decent performance on a 3G cellphone. But Metcalfe won't round up the number, even now. In 1973, he explains, the 60Kbps rounding error that would require was serious bandwidth in itself: more than the speed of a transcontinental Internet trunk. But compared with those 300bps desktop connections, the new network was an embarrassment of riches, about 10,000 times as fast. In designing the network, they emphasized distributed computing, a new concept that was at the center of all of PARC's work at the time. It represented a shift away from the large, centralized time-sharing systems that dominated electronic computing since its inception in the 1950s. All the PCs on the Ethernet LAN shared one cable, and the algorithms that ran the network were distributed among them. Each participating computer got an add-on board in which Ethernet microcode was implemented on a standard microprocessor. "It was just a cable running down the corridor and all the attached PCs would just plug into that cable near where they were," Metcalfe said. Metcalfe and Boggs had the network running by November 1973. At first, PARC employees could order an Alto with or without Ethernet, but soon everyone depended on it, Metcalfe said. One reason was an application for testing each Alto's semiconductor memory, which was still an unproven technology. PARC scientist Chuck Thacker wrote a diagnostic routine that would run on the Alto and test its memory while the user was away. It sent the test results to a maintenance system over Ethernet. But the main uses were sending jobs to printers and reaching Arpanet via an early router and long-distance lines. Evolution was gradual: Laser printers came in 1974 and email around 1976, Metcalfe said. Throughout the 1970s, the use of Ethernet expanded, but only around Xerox facilities and a few other institutions, such as Stanford and MIT, where cutting-edge computing research was being done. The White House also got Ethernet, along with some Altos that Xerox donated. For a time, Xerox was preparing to sell Ethernet as a commercial product, called The Xerox Wire, as part of a proprietary office system. But in 1980, the company instead proposed it to the Institute of Electrical and Electronics Engineers as an open standard. In the intervening years, other companies had come up with their own LAN schemes, so there were many other approaches in play around the industry. In the end, the IEEE designated three as standards: Ethernet, IBM's Token Ring and a system from General Motors called Token Bus. Though GM's entry didn't go far, Token Ring and some other LANs, including ARCnet, survived. "We then spent a few years killing each other, and eventually Ethernet won," Metcalfe said. "But it was a long eventually." By the late 1980s, Ethernet had effectively won, Metcalfe said. Its backers had included Intel, Digital and a small company Metcalfe himself launched to serve the nascent market for adapters and network gear, called 3Com. PARC's team had taken Ethernet up to 20Mbps, but to ensure it would work on Intel's chips, they scaled back the proposed standard to 10Mbps. Still, they weren't sure anyone would need that much speed. Eventually people did need that much Ethernet, and then some. "We argued about whether 10 was too much. And then came 100Mb, and then a gigabit, and then 10Gb and 40Gb, and now 100Gb, and now 400Gb is being standardized, and terabit is being talked about," Metcalfe said. "The big surprise has always been that new applications emerged each time we sped up Ethernet." As with other widely used technologies, success has bred more success. Each iteration has gotten cheaper as it's grown more ubiquitous. One key to Ethernet's success is that every successive version has been backward compatible with the previous ones already in use, Metcalfe said. Metcalfe shares the patent for Ethernet with Boggs, as well as Thacker and Butler Lampson, another PARC guru. Many others at PARC helped develop software and hardware for the new network, he said. Today, Metcalfe teaches at the University of Texas at Austin and says he's winding down a career as a venture capitalist at Polaris Partners. Boggs co-founded LAN Media, a maker of network adapters, which was acquired by SBE in 2000. Ethernet, which started out on coaxial cable and later moved to twisted-pair cable, has also been extended to other media and, depending on whom you asked, helped spawn other network technologies. If 1Tbps speed wasn't in its creators' minds, different forms of Ethernet were. In the May 22 memo, Metcalfe envisioned The Ether Network running over cable TV or phone lines, radio, and even powerlines. Ethernet ultimately would come to all those other media, including wireless, where it formed part of the basis for Wi-Fi, according to Metcalfe. The technology has evolved into something far different from what he and Boggs built, and along the way it has had "hundreds of inventors," Metcalfe said. That's why he's looking forward to Wednesday's event. "One of the things inventors do when they gather is they argue about who invented what, and who was first, and who the charlatans are, and you see all of this really ugly behavior," he said. "I'm just like those people. "I'm also old enough to realize how ugly that can get. So I'd much rather stop arguing with them and just celebrate their contributions," Metcalfe said. "At our conference on May 22, I'm hoping to get all the unsung heroes of Ethernet to show up and tell their side of the story."